We’ve just been sent this lovely piece from one of our blog readers who took a trip to Australia earlier in the year. The tour began in Melbourne, Victoria, with a visit to the Shrine of Remembrance set among the lush and beautiful Royal Botanic Gardens. 114,000 Victorians enlisted in the First World War. Of the 89,000 of them who served abroad 19,000 were killed. They were buried in distant graves far from home at a time when most Australians did not travel abroad. The Shrine provided a place where Victorians could grieve as individuals, as families or as a community. It also served to honour the courage of the men, women and children who remained at home. The shrine was built by public subscription at a time of considerable national hardship in Australia as in Britain. 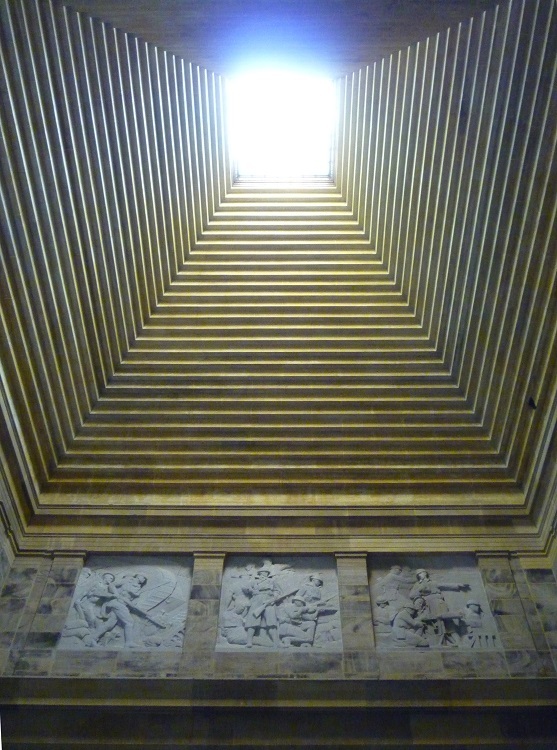 The inspiration for the external outline came from one of the seven wonders of the ancient world – the mausoleum at Halicarnassus to Mausolus, King of Caria in South West Asia Minor. It was opened by the Duke of Gloucester in November 1934 in front of a crowd of 300,000. The shrine is equally spectacular inside, but achieves a profound sense of calm conducive to remembrance of the ANZACs who gave their lives in two world wars and in subsequent conflicts. 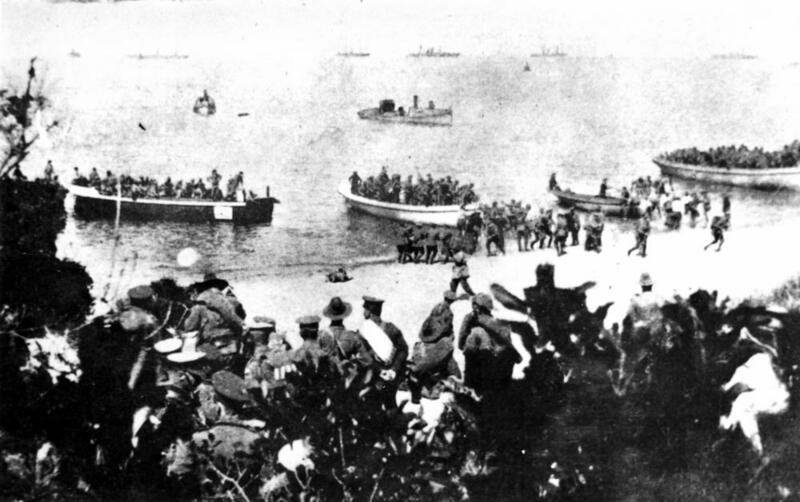 Australian and New Zealand Army Corps (ANZAC) was formed in December 1914 and was heavily engaged in the disastrous British-led campaign in the Dardanelles. Otherwise known as the Gallipoli campaign, the very word has a deep resonance for Australians. 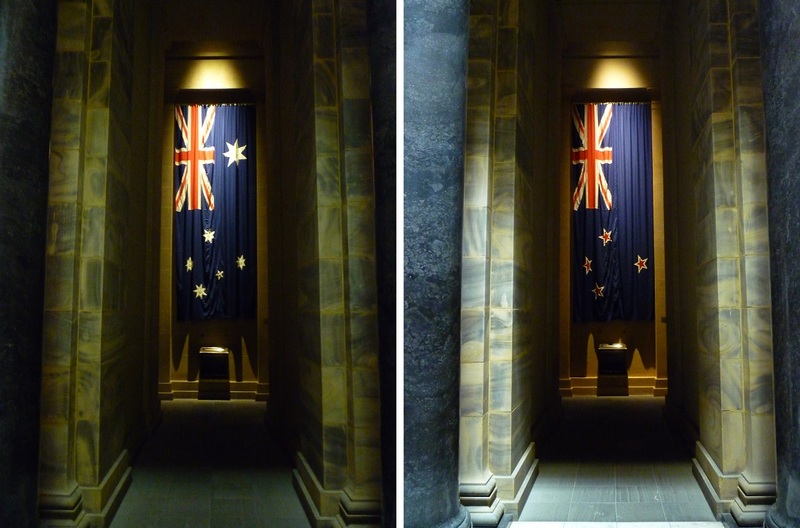 In keeping with the composition of the ANZAC, the flags of Australia and New Zealand hand vertically facing each other inside the shrine. James Lawson was born in Halifax, Yorkshire and went to Australia in 1905. On 20 August 1914, just weeks after the outbreak of war, he enlisted in the Australian Imperial Force (AIF) and was commissioned second lieutenant in the 4th Light Horse Regiment. He served first on Gallipoli and later in Sinai and Palestine. In May 1917 he was promoted major and placed in command of A Squadron. On 31 October 1917 Lawson’s squadron, and another from the 12th Light Horse Regiment, led the charge at Beersheba. 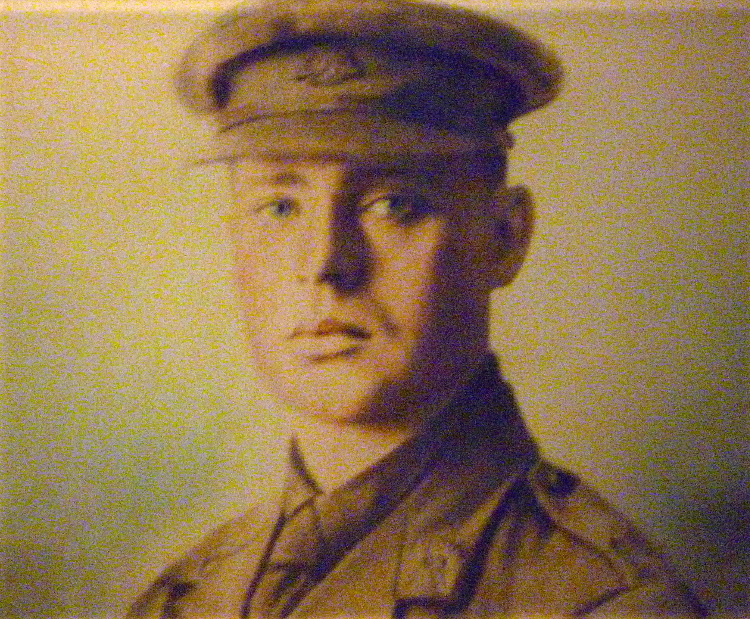 Lawson’s regiment later took part in the capture of Damascus led by General Allenby in September 1918. He returned home in January 1919 and lived out his life in Wimmera, Victoria, a modest but much admired and respected citizen. in the Shrine of Remembrance, Melbourne, Vic. Sergeant James Offord of Bendigo, Victoria, enlisted in the 4th Light Horse Regiment and served in the Sinai-Palestine campaign, and was awarded the Military Medal. He made a souvenir of a Turkish flag after the battle of Beersheba, 31 October 1917. 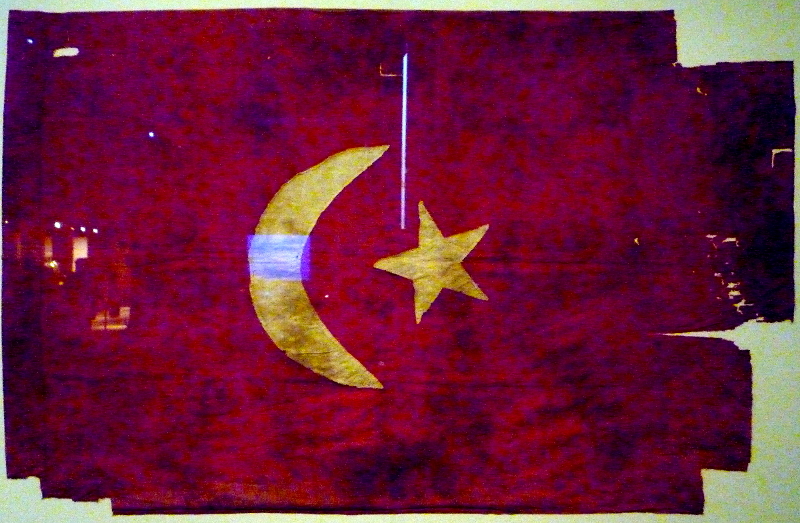 Turkish Flag from Beersheba in the Shrine of Remembrance, Melbourne, Vic. 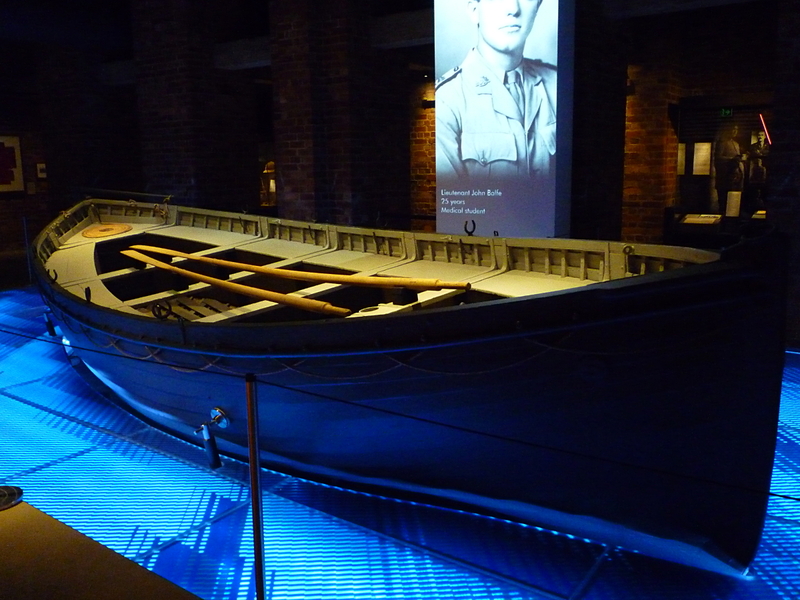 Also in the Shrine is one of the only two landing craft to survive from Gallipoli: the other is at the Australian War Memorial in Canberra. 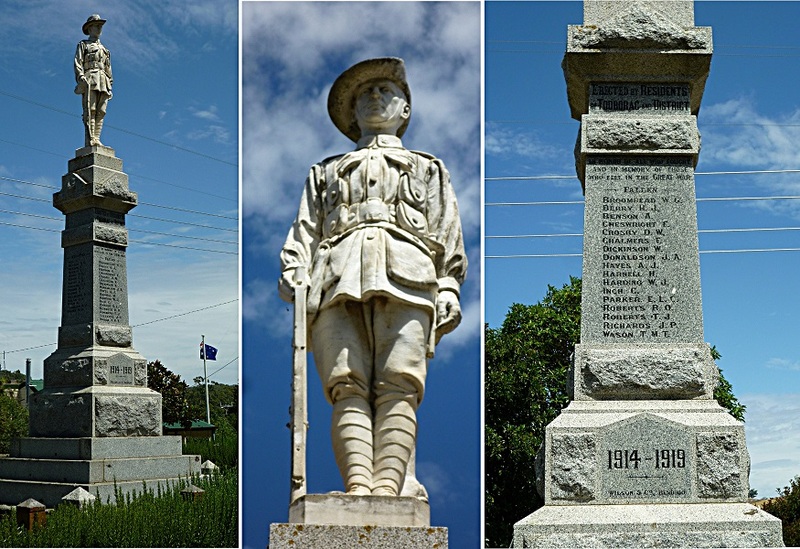 Northwards into upstate Victoria and seemingly every city, town and village has its war memorial, always lovingly cared for and usually surrounded with trees and flowers. 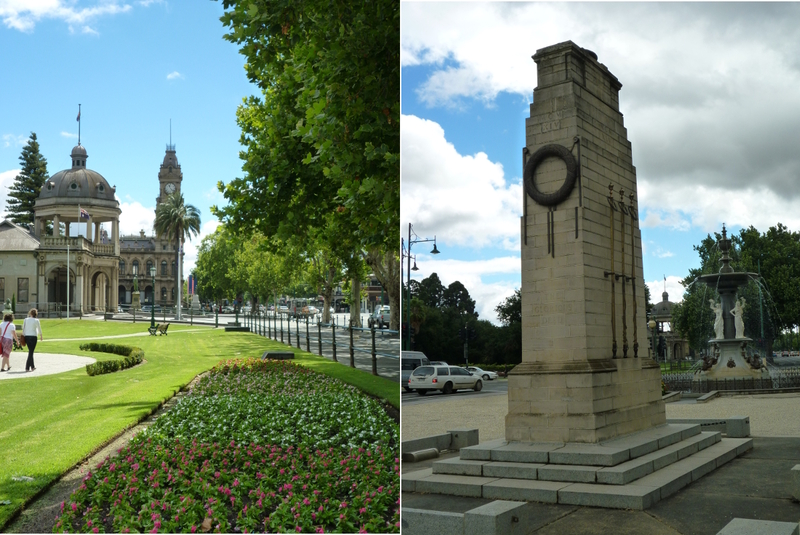 In Bendigo, the domed war memorial lies a few hundred metres from the cenotaph. Bendigo’s wealth came from the Victorian gold rush of the 1850’s and the town centre is a filled with elegant buildings from that time and later. At the end of World War One, the small rural community of Tooborac raised £600 by public subscription to remember the seventeen soldiers who did not return. The memorial consists of a granite column with a white marble figure of a soldier standing to attention. On the Murray River, which forms the border between Victoria and the state of New South Wales, lies the town of Echuca. It was once a thriving trans-shipment point for the steam-driven paddle steamers bringing cargo hundreds of miles up the river from the sea near Adelaide. It is now a flourishing tourist centre and a welcoming place to visitors from England. 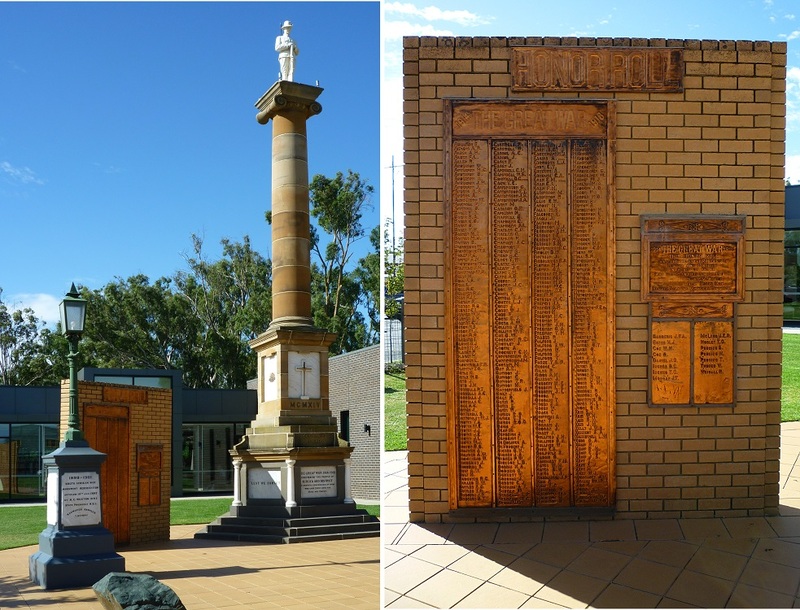 Here, the memorials to the men who fell in the South African wars, as well as the two world wars and later conflicts, are grouped together outside the quiet of the public library against a backdrop of the gum trees along the river. The memorial remembers all those from the Echuca District who went to fight, not only those who did not return. The Australian War Memorial in Canberra is the national memorial. It stands elevated on the slopes of Mount Ainslie and lies in ceremonial alignment with the old and new Commonwealth Parliament Buildings across Lake Burley Griffin. The Australian War Memorial, Canberra, viewed looking up Anzac Parade, and the view from the Memorial to the Parliament buildings. On a sunny Sunday morning walking up Anzac Parade the temperature is 30°C, the air is dry, clear and fragrant with the smell of eucalyptus, Holy Communion is being taken nearby in the Anglican church of St. John the Baptist, and all is peaceful and quiet. Anzac Parade is lined with memorials that capture the eye and the camera. 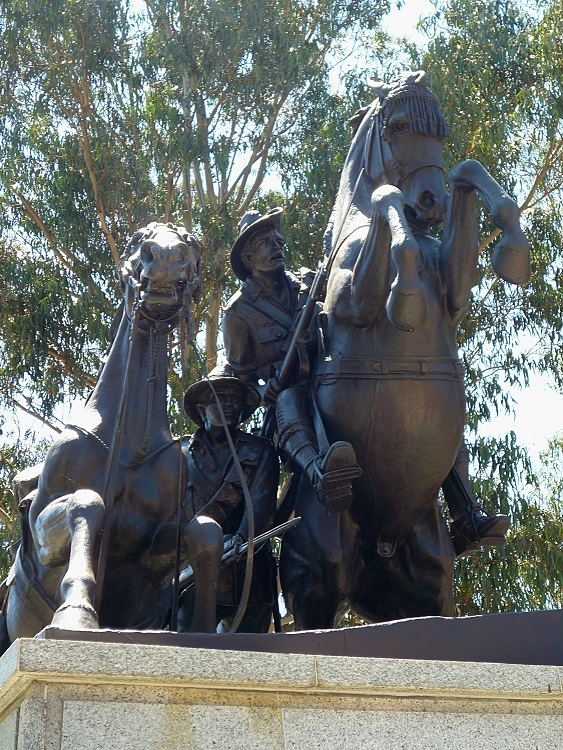 The Mounted Memorial shows Australian and New Zealand Army horse riders in action. The horse of the New Zealander on the right has been injured or shot, and the rider is falling to the ground; the rider on the left is supporting his mate. The original memorial stood in Port Said, Egypt, but was badly damaged in 1956 during the Suez Crisis. This is a replica unveiled in 1968. 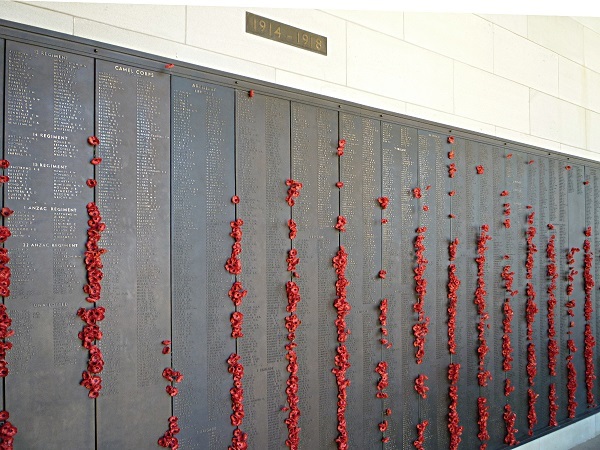 The Australian War Memorial is a place of remembrance, a museum and an archive. 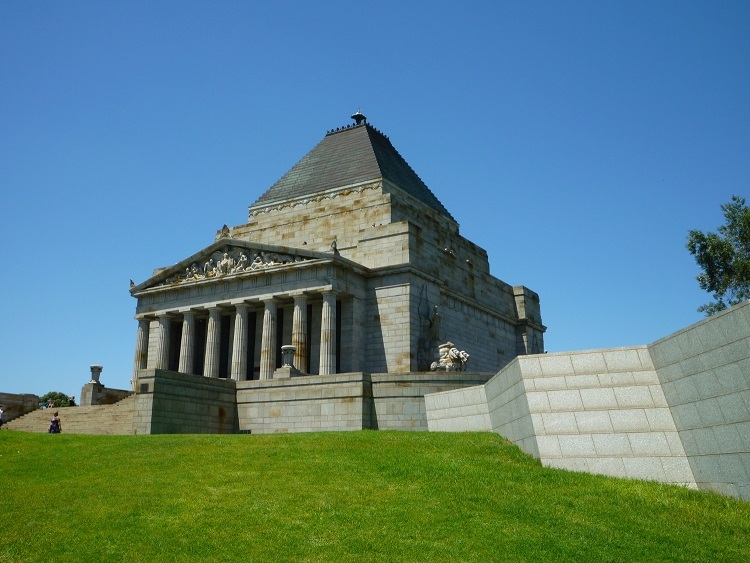 It contains the Tomb of the Australian Unknown Soldier. The heart of the commemorative area is the Hall of Memory, a tall domed chapel with a small floor plan in the form of an octagon. In front of the Hall of Memory is a narrow courtyard with a memorial pool surrounding an eternal flame and flanked by sidewalks and shrubbery, including plantings of rosemary for remembrance. Above the courtyard to either side are long cloisters containing the Roll of Honour, a series of bronze plaques naming the 102,185 Australian servicemen and women killed in conflict or on peacekeeping operations. The plaques include names dating back to the British Sudanese Expedition, the Second Boer War, and the Boxer Rebellion. The entire long wall of the west gallery is covered with the names of the 66,000 who died in World War I. The east gallery is covered with the names of those who died in World War II and conflicts since. Plans to honour an unknown Australian soldier were first put forward in the 1920s, but it was not until 1993 that one was at last brought home. To mark the 75th anniversary of the end of the First World War, the body of an unknown Australian soldier was recovered from Adelaide Cemetery near Villers-Bretonneaux in France and transported to Australia. After lying in state in King’s Hall in Old Parliament House, the Unknown Australian Soldier was interred in the Hall of Memory on 11 November 1993. He was buried in a Tasmanian blackwood coffin, on which were placed a bayonet and a sprig of wattle. Soil from the Pozières battlefield in France was scattered in his tomb. Among the many displays in the museum are the paintings of George Lambert. 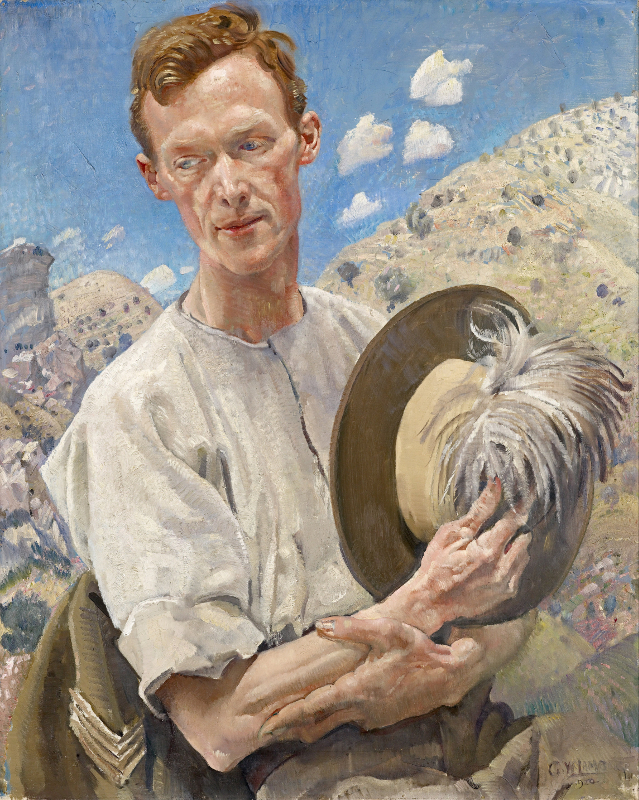 Lambert served as an official war artist in Sinai-Palestine and was a member of the Australian Historical Mission that went back to Gallipoli in 1919. During this period he recorded, in hundreds of small oil and watercolour studies, the landscapes in which Australians fought and the details of their everyday lives. He later undertook larger commissions, one of the most famous of which is ‘The Charge of the Australian Light Horse at Beersheba’, which captures some of the drama and chaos of the 4th Light Horse Brigade’s thunderous charge on the Turkish trenches south of Beersheba on the late afternoon of 31 October 1917. Onward to Sydney, by train through rural Victoria and New South Wales. 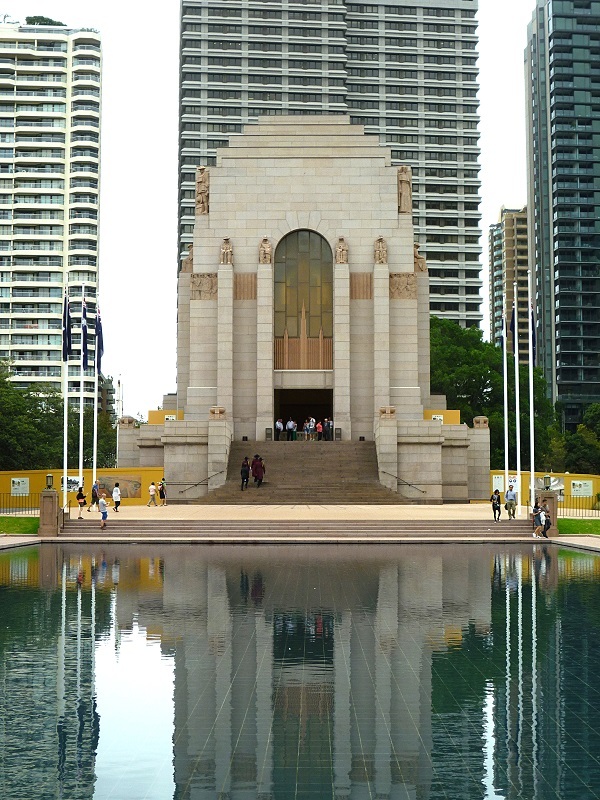 On an overcast and humid Australia Day (26 January – the date on which the First Fleet arrived at Sydney Cove in 1788), the ANZAC Memorial in Hyde Park did not look at its best. The reflecting pool struggled in its greyness to reflect the pink marble cladding of the Art Deco memorial. 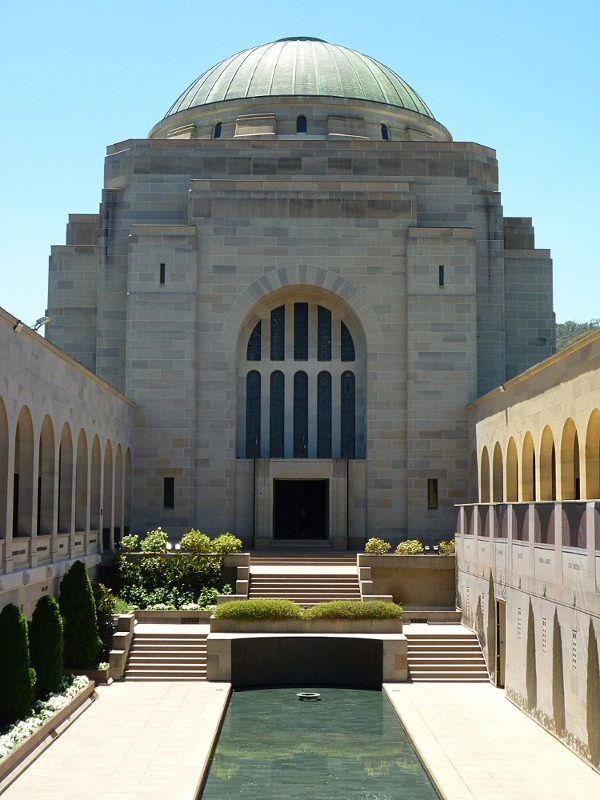 The interior is largely faced in white marble, and features a domed ceiling adorned with 120,000 gold stars – one for each of New South Wales’ military volunteers during World War I. However, the centrepiece of the interior is the monumental bronze sculpture of a deceased youth, representing a soldier, held aloft by a caryatid comprising three female figures, representing his mother, sister and wife. There are two allusions which strike one when first seeing the figure: the Spartan mother’s farewell injunction to her son to uphold Spartan values of bravery as he went to war, “[Return] either with it [your shield] or on it”. A hoplite could not escape the field of battle unless he tossed away the heavy and cumbersome shield. Therefore losing one’s shield implied desertion and cowardice. The youth in the ANZAC Memorial returned dead, carried on his shield, and hence, brave. His arms are extended along a sword in the manner of Christ crucified, and one is reminded of the three women who tended Christ after his decent from the Cross. With thanks to: sydneyemeraldcity.blogspot.co.uk/ – my photograph is terrible! 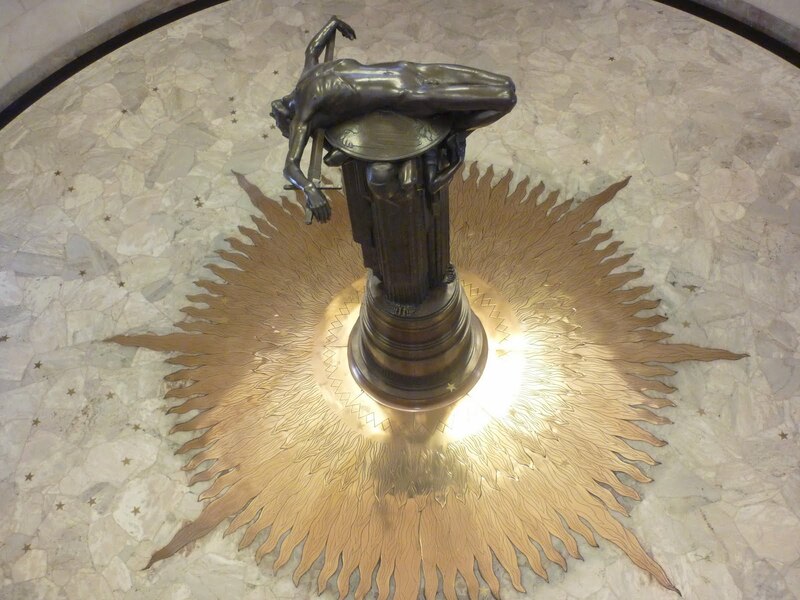 ‘This is the central motif of the Memorial’s design. … Thousands of women, although not directly engaged in war activities, lost all that was dear them – sons they had borne and reared, husbands, fathers of their children, friends, lovers. … There was no acknowledgement of them in casualty lists of wounded, maimed and killed. They endured all men’s sacrifice quietly. In this spirit I have shown them, carrying their load, the sacrifice of their menfolk. 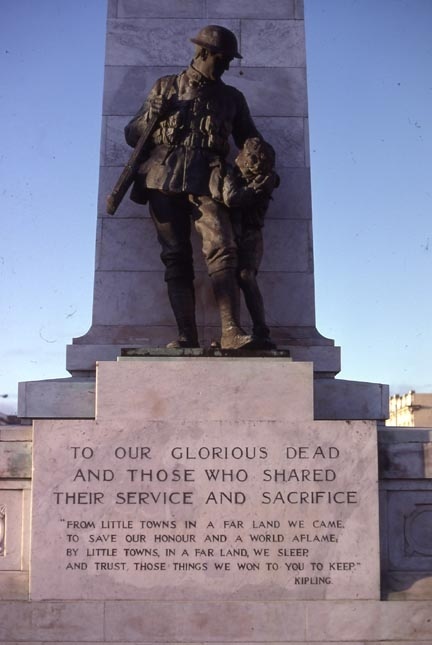 … Sacrifice is a shift away from the rhetoric of honour, glory and manly deeds manifested in earlier memorials – Hoff had seen too much of war to glorify it. From the AWM website. Four white marble panels inside the memorial appear almost as regimental standards bearing Australian battle honours for the First World War, including the largely forgotten (in Britain) battle of the Cocos Islands, the Royal Australian Navy’s first victory at sea on 9 November 1914. A visit to some of the war memorials of Australia (and New Zealand) remind us that 1914-1918 was indeed a World war. Unless a URL is quoted, the photographs are those of the writer and may be freely used for non-commercial purposes, with an acknowledgement to the Norfolk in World War One blog: https://norfolkinworldwar1.org/ (the images have been reduced in size/quality for publication on the Internet and higher resolution ones can be shared on request. This entry was posted in Visit to a WW1 related location and tagged ANZACs, Australia, Canberra, Melbourne, New Zealand, Sydney, War memorials. Bookmark the permalink.